An astronaut evaluates the Portable Foot Restraint in space in 1993. 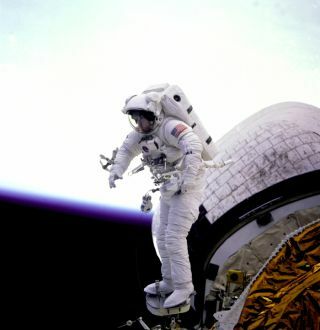 In this historical photo from the U.S. space agency, Mission Specialist James H. Newman conducts an in-space evaluation of the Portable Foot Restraint (PFR) which will be used operationally on the first Hubble Space Telescope (HST) servicing mission and future Shuttle missions. He is positioned on the edge of Discovery's payload bay. Behind him the starboard Orbital Maneuvering System (OMS) pod can be seen with the soft glow of an Earth limb.